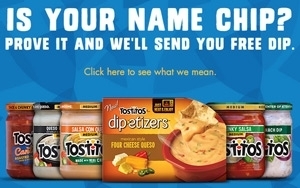 To celebrate National Chip and Dip Day on March 23, Tostitos is offering a coupon for one free Tostitos-brand dip to anyone in the U.S. with the name (or nickname) Chip. The Frito-Lay brand is inviting Chips to visit www.EveryChipGetsADip.com between March 19 and 23 to submit an image "proving" that that's their name — along with name, address, email address and date of birth — to receive a coupon for the free dip (while the 50,000 allotted supplies last). "Proof," according to the site, can be a picture of the person "in a personalized bowling shirt, on a fan-club membership card, in a note from your mom, ANYTHING." Furthermore, the official rules state that it's okay to enter by "turning yourself into a Chip" by visiting http://www.faceinhole.com/Tostitos/ and uploading an image of your face into one of the pre-approved "chip" images provided (including a chipmunk and a guy chipping away at a stone statue). Consumers who live in one of the several U.S. towns with names that begin with "Chip" (including Chippewa Falls) also qualify to request a coupon. To publicize the promotion, the brand is using a video that includes an appearance by Erik Estrada, a star of the '70s TV show "ChiPs," social media and PR.